It has been an awful lot of work, but I am very pleased to show you the completed project, and Robbie is delighted with the results. To view two more images please click the links below this first image. 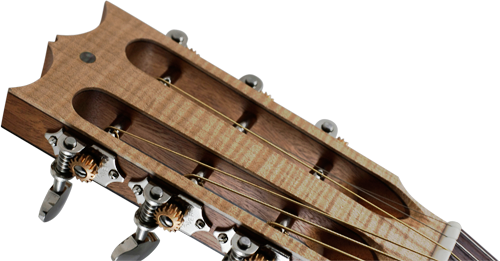 For many more images of this instrument, look for them in my VaultBack, Construction and Details galleries, in my galleries' page. If you're new to this project you can read-up on its progress by clicking back on the last eight postings here. 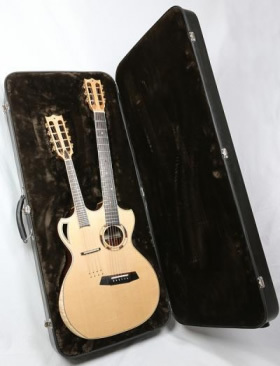 For anyone interested in having one of these instruments made, the starting price shall be �10,999.00. Everything is entirely made by hand. No CNC machines, no laser cutters, no routers, no thickness sanders. Just traditional skills, top quality hand tools and lots of patience! For those of you asking "Why?" Well, the structural refinements I employ in these instruments are quite simply not feasible in a production based outfit, and most of these processes quite simply would not be practical in a machine based outfit. Imagine setting up a jig for a router that has to fit tantelons to an individual curve for each one of them on a vaulted back, for just one example - that's 86 per side on average! When you use machines you also disregard the constant touch and feel understanding of the materials being used. Simply handling the parts constantly as you construct them by hand helps massively to hear, and feel the end result. As they say: the proof of the pudding is in the eating.